22nd -23rd Apr. ’18 Trials to choose the S. A. State Team will be held on Sunday 22nd and Monday 23rd April 2018. Entry forms to take part in the Trial can be downloaded from the ‘Forms’ page of the S.A. website. 19 Aug ’16 Please welcome and note South Australia’s new website address http://www.armbowlers-sa.org.au Check it out! Entry forms for these events will be sent to Clubs in January but we are giving prior notice because many people like to plan trips away after the end of the bowls season. Regards, Rodney Egge, State Bowling Arm Coordinator. We meet once a month on the first Monday at the Tranmere Bowling Club, Magill Road, Tranmere at 12 noon. There we select teams from our players and usually have 2 X 8 ends of bowls during the afternoon. We finish around 5.00 pm. Our annual membership fee is $5.00 this covers stationary costs etc. To bowl at our Bowling Day costs $5, this covers our use of the greens to Tranmere where we pay a nominal fee for each player. There are many bowlers at the moment looking at Bowling Arms so at our Meeting Day, we offer numerous arms for them to look at and they can then go away and buy what suits. We offer coaching by experienced bowlers for around 2 hours free of charge, after that time they are positioned into a team for further experience in the use of the arm they wish to use. Prior to them purchasing an arm they are measured up so they know what arm is proper for them to use in the future. We also offer coaching Free of Charge to any Clubs that have aged or injured players that are looking at giving the sport away. This Coaching Session is carried out at the Clubs who have asked us to attend, and they find that many of their players, previously looking at quitting, are staying!. At these sessions we usually have 50 -60 people turn up and around 87% will start using an arm during the day. We allow them to play about 10 ends to give it a try, the comments after the games are great to hear with a lot of them commenting that they are after all the ends, are not aching or sore, so in essence we have achieved what we set out to do. President, South Australian Bowling Arm Association Inc.
“We are always looking for opportunities to put one or more Bowling Arm rinks in local club carnivals. Our membership officer sends out a monthly email notifying members of upcoming carnivals and calling for expressions of interest from members who would like to play in a Bowling Arm rink at one of those carnivals. 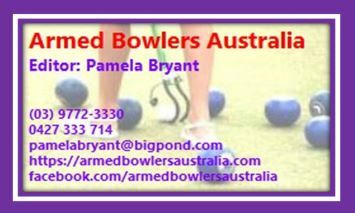 We put the rinks together from those interested and enter the rinks as a team from the Bowling Arm Association.